Think about it-in a world where our life is dictated by clocks, kids’ sports practices, meetings at the office, and family obligations, we have to streamline dinner and other meals to meet those deadlines. 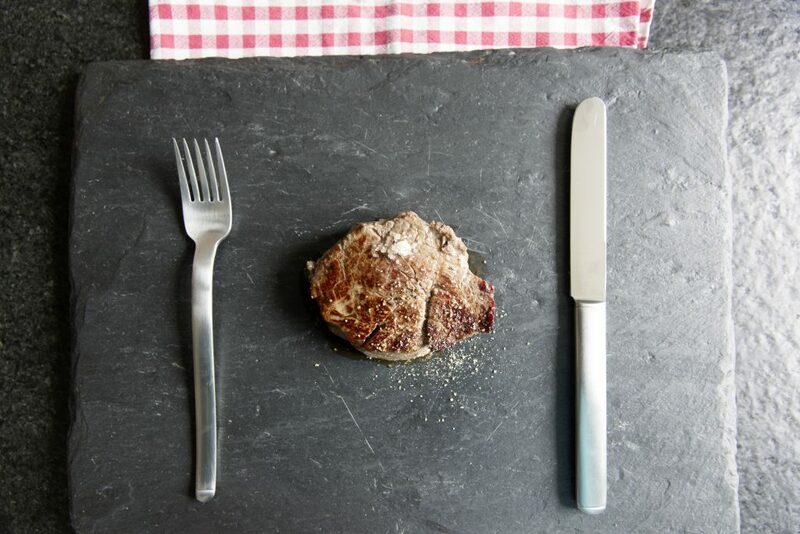 Our Blackstone grill reviews will get you off on the right foot and make it, so you end up with the greatest gas griddle you ever knew. And you will be a lot like me and wonder what in the world you ever did without it! We will let you know how to clean it, care for it, and make sure you are a confident buyer. 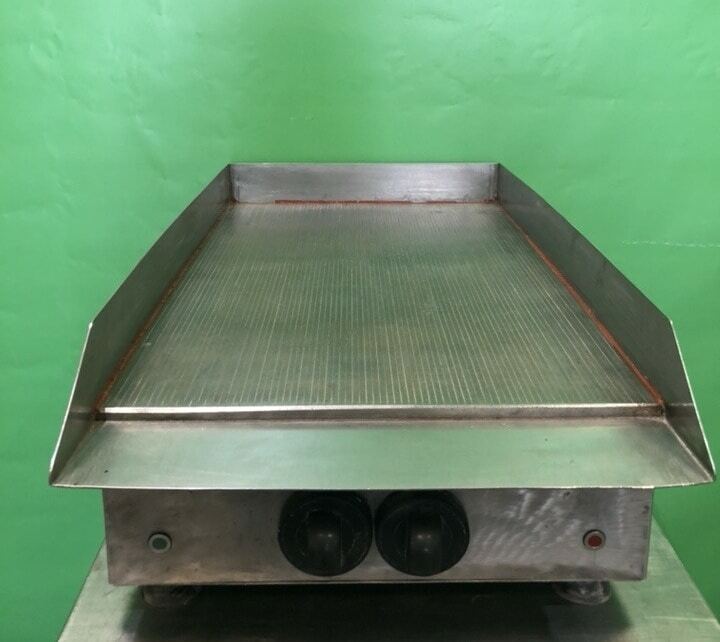 What Are Some Benefits of a Blackstone Griddle? 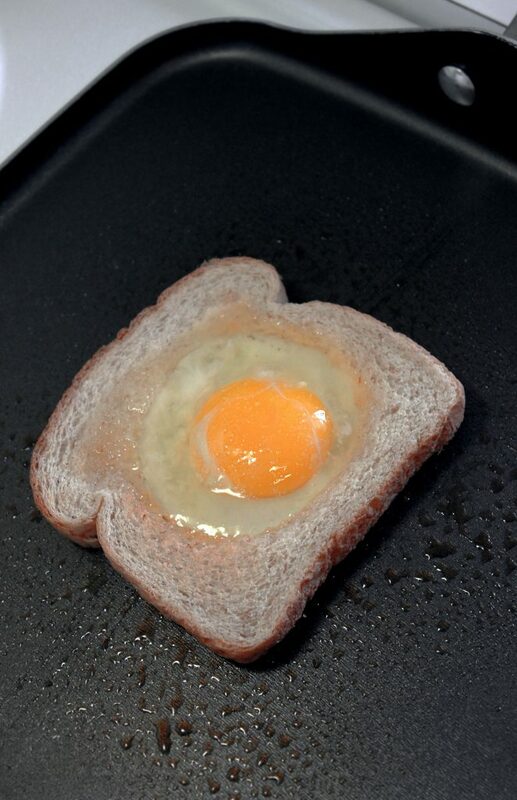 Having a Blackstone gas griddle is really a time-saver, to be exact. I have two kids, a wife, and a mother-in-law who lives in our finished basement. Naturally, we have a full and busy house all hours of the day. My son and daughter go to karate and dance, respectively, and are hungry after they get home from their practices. My wife works as a teacher and volleyball coach and is always ready to eat-she often uses lunch breaks to do grocery shopping or errands. My point is, our house is full of hungry people who often demand more than one burger, pancake or bacon strip. That’s where this lovely grill comes into play. I can whip up multiple burgers, grilled cheeses, chicken breasts and grilled veggies like you wouldn’t believe. And nobody has to wait for seconds! Another great benefit is that the cooking surfaces on these is huge, so you have plenty of room to move around when using your Blackstone outdoor griddle. I will cover the sizes of the griddles in the next segment as well as how to clean them. You also needn’t worry about keeping matches, lighter fluid and charcoal around your home. These are hazardous and shouldn’t be around children anyway. As a parent, that in itself is a great benefit. Us parents have to clean up after the kids and the pets all day, so we want to minimize the cleanup that dinner entails. 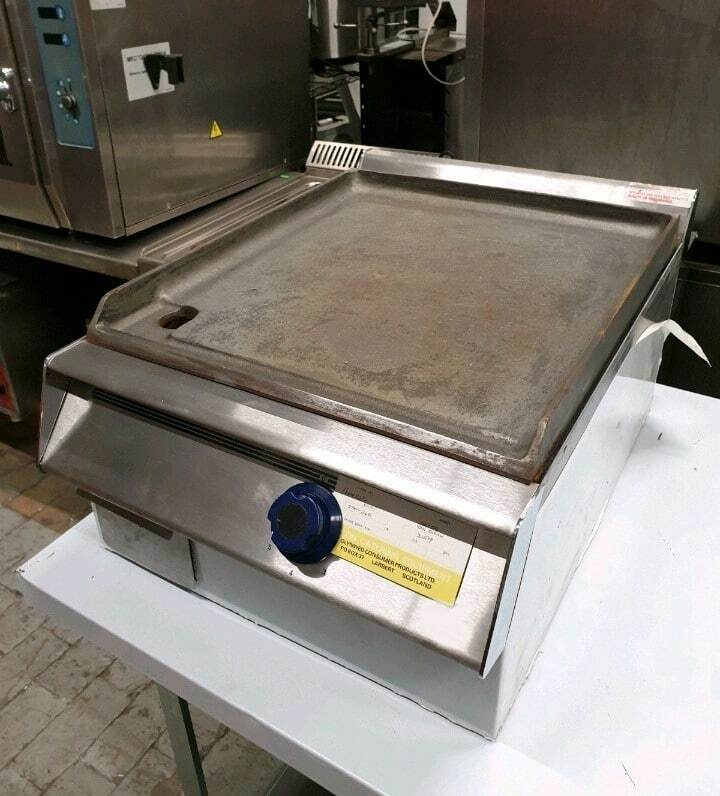 The good news is that cleaning Blackstone griddle is nice and easy, no matter which size you have opted for. I will list the steps in a numerical form-copy and paste them into a word doc and print them out-that way you will never forget. Let the griddle cool off so your hands don’t get burned. 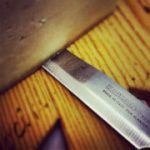 Scrape the surface with a metal spatula or grill scraper tool. Wipe it down using a paper towel. Pour plain water (not soapy water) onto the griddle while it is still warm. Rub a nylon scouring cloth or pad on the surface. Rinse off the water using paper towels. Dry it with a cloth so you can avoid rust. Season by rubbing oil on the surface and then store it in a cool, dry place. This protects you from rust. Once I assembled this Blackstone grill for testing, I was happy with what I saw. It has two great shelves so one side can hold ingredients and spices, and the other can hold tools. It has great locking caster wheels on it, so once I get it into position, it just stays still. It won’t roll away which is a fear of mine, as crazy as it may be. I liked how huge this thing was. I made omelets for my family and guess what, I fit everybody’s omelets on the griddle plus hash brown potatoes. I used two eggs per omelets, pre-chopped the veggies and ham, and brought out the bag of cheese with me. It was a breeze from there to get those omelets made fast and get everybody eating at the same time. Everybody was served, and I turned off the grill right after everything was dished out. And because I made so much, everybody felt satisfied and there was no need to stand there and cook more food. Aside from the convenience you get from this grill, you will also enjoy the four heat zones that are independently controlled for a total of 60,000 BTUS. I was able to cook up the omelets and the hash browns on separate temps for an easy and convenient meal. If your family is a camping sort, you can fold this griddle up and take it with you. That’s right-you can fold up the legs and remove the griddle top to go with you on family camping trips. 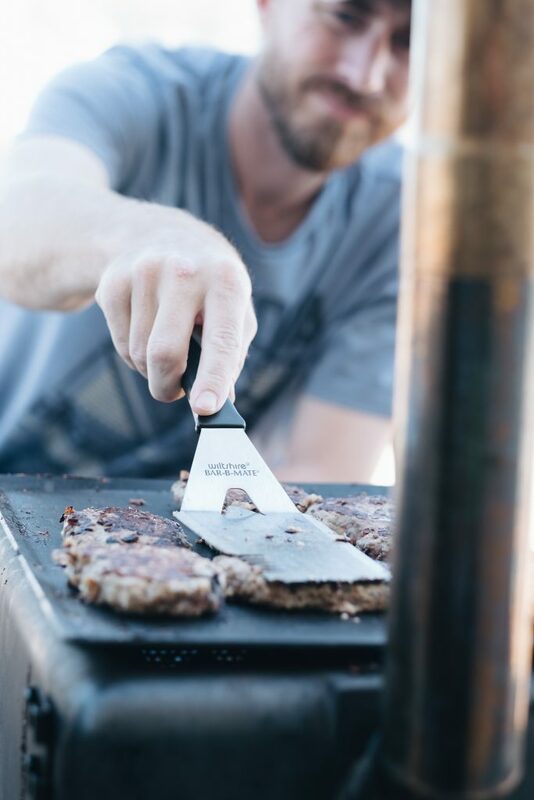 We do not personally camp, but this is a great tool for those who do or even families who have day-long sports competitions want to make burgers and hot dogs for the team or just make it fun by turning it into a cookout. You could easily take it to a park for a family party, too. My bottom line: It’s a great grill. You can cook anything you like on here, and the surface area is huge! Get it if you have a big family or love to have people over. Easy to start, just push the button and it fires right up. Huge surface area-you can fit the whole family’s foods on here. 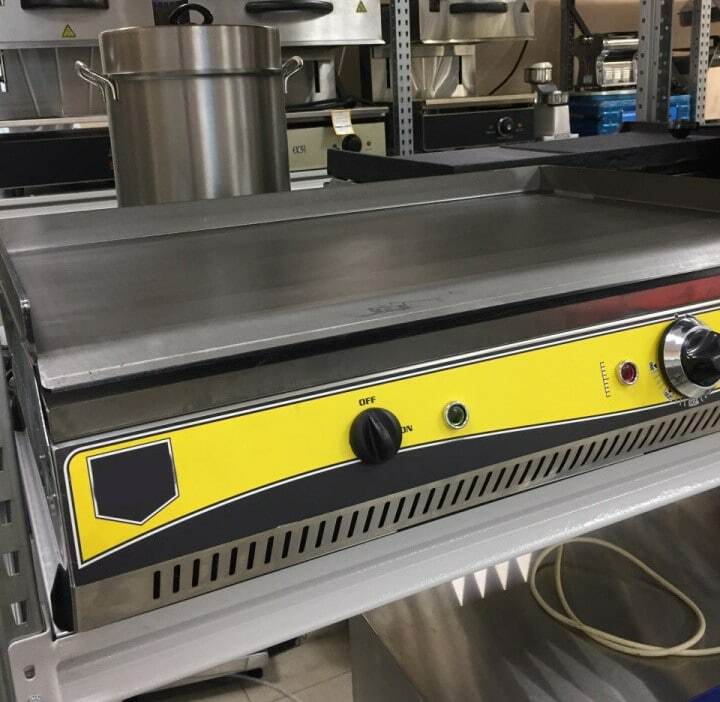 Heat zones are adjustable, so foods of different types can be cooked on here with no fear of burning them or under/overcooking. 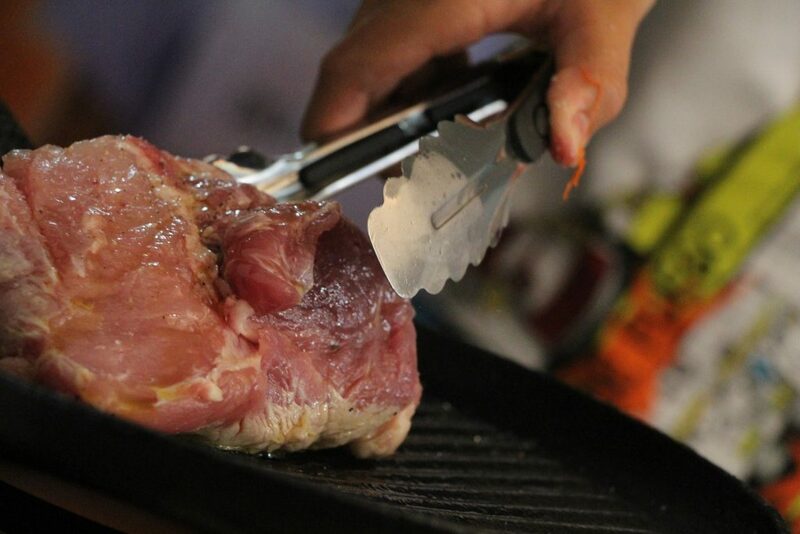 Grill is not pre-seasoned, you will need to do that yourself-it’s still pretty easy. Grease trap tends to overflow, state some users. You will need to purchase a separate cover to make sure your investment is protected. Enjoy hitting up the football game with friends? How about camping? This is great for both. Also, if you live in a place that doesn’t have a lot of space, but you’d still like to grill, this one will be perfect for you. I’m looking at you, people who live in high-rise apartment buildings. All you need is a one-pound propane bottle for fuel, and you will be all set for camping/tailgating/high-rise grilling. Our test meal here was some good old-fashioned burgers. We made baked potatoes in the oven and decided to serve them with a juicy hamburger, and this griddle definitely delivered on its promise. It was a squeeze, but I did fit four quarter-pound burgers with ease on the griddle. I also managed to grill a few onions on the side for a delicious topping. It fit neatly on my picnic table and was really a joy to use. Turning it on is a breeze, just hook up the propane and turn the dial exactly to the temp you want. If you need a bigger propane tank you can definitely buy an adapter hose to use a bigger propane tank. No need to worry about running out of propane here! The single h-shaped burner contained within this beauty of a griddle keeps everything heated and even. There is no need to feel around to get an idea of where the hotspots are-it just works every time you try it. You will have to pre-season this grill, so do bring enough oil for cooking as well as seasoning. It even has a carry bag available for purchase so it’s easy to take around to all the fun family events you attend. My only gripe with this particular griddle is that it is going to be much too small for most families. It makes a great camping griddle, but I’d suggest a larger one if you’ve got more than two people living at home. My bottom line: Great for camping, small families, and small spaces. Packs the same punch and quality as a full-size Blackstone flat grill, without all the added bulk. A great asset to your gear. Easy to clean up-pour on water while hot and wipe with paper towels when cool. Rugged and will be okay during transit, report users who took it on the road. You will need a windscreen if cooking in a windy/breezy area. Users indicated a poor customer service experience when they had to contact them. Grill is not pre-seasoned, so you will need to pre-season it before cooking. We had the chance to check out the 22-inch version of this griddle as well as the 17-inch version. This one is pretty great. It does the same things as the 17 inch version, but you do get a larger cooking space. I personally enjoyed this one better because of the larger cooking area, but it really is a matter of a personal preference. Features to look forward to in this great little griddle include a great size for a smaller griddle-330 sq. inches of cooking space, to be exact-and portability. It’s very nice for camping and tailgating. You can also use it in a place where space is an issue, or if your homeowner’s association does not allow full size grills. The grease management on this one was a feature I enjoyed. The catch actually draws away the grease from your food, making it healthier overall. It was good to get the excess fat off the foods, as it made me feel better about serving it to my family. I really thought this grill did a nice job for a great price. The test meal we did for this particular griddle was just some veggies and chicken breast strips for chicken fajitas. I enjoyed seasoning up the meat and cooking it with ease right on my picnic tabletop, and the veggies softened up nicely on the griddle. My whole family enjoyed the meal, and I enjoyed the convenience. To start enjoying this griddle, you only need a 1lb propane bottle, and to season it ahead of use. Other than that it is super easy to clean and care for. Clean it as you would any other of these fine griddles. Proper care will ensure it lasts a good long time. As with the other griddle, you can purchase the bulk tank adapter if you need to use a 20 lb propane tank. It’s really great for just enjoying the fresh air and having dinner outdoors without all the bulk. It is super great for camping-those that do not want cooking smells in their camper can use this outdoors for great meals. It goes anywhere. Just carry it in the trunk of the car or the camper. Has two burners to regulate the grill surface temps for proper food prep. The griddle comes unseasoned, so you have to season it yourself first. Cooking surface is nonstick, but some food stuck to it, reported some users. During our test, the grease trap stayed put. But for some users, the grease trap tended to slide out. This is our third to last of the Blackstone cooking grills, and it does not disappoint at all. This one really packs a good punch and I was really pleased with the construction of the grill and how easy it was to use. One thing I did notice right off the bat was the lack of a shelf on the right side of the grill. From the first Blackstone I used, I more or less got used to having that nice second shelf available to me on the right side. Either way it was easy to enjoy cooking on this big 28-inch flat top griddle. I made up a huge serving of pancakes one morning for the whole family plus some eggs on the side as our test meal. It went off without a hitch. 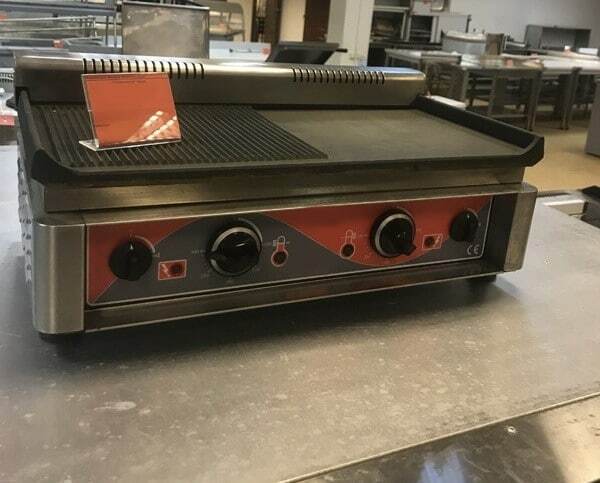 Even though there were only two heating zones on this griddle, it still was easy to control the temps needed to ensure a safe and easy preparation process. And I get the joy of ditching my matches, lighter fluid and charcoal bags, so that is a huge plus, too. Once again, you get the nice caster wheels-therefore you don’t need to worry about it rolling away. And, you can definitely move this around using those wheels. We actually had a bit of a mishap involving some paint that got spilled onto our patio and found it very convenient to simply move the grill away while cleanup took place. So, the cooking was simple and easy on this. As always, I treasured the easy ignition button-so simple and fun to use- and of course am grateful for the H style burners contained within the grill itself. And don’t worry-some people think “griddle” and think only breakfast foods and Japanese style foods can be prepared here. That couldn’t be further from the truth-you can definitely make world class steaks, grilled fish, and even nice grilled bread like Texas toast on this baby. I even made Reuben sandwiches one night, it turned out lovely. The cheese and sauerkraut, corned beef and Thousand Island melted together to form a sandwich of perfection thanks to this grill. My bottom line is that I am very happy with this grill, and I think most families would be too. The only real issues I had with it were the lesser cooking spaces, (I think bigger is better) and the fact that there was not a second shelf on the right like I had seen before. Otherwise go for it! Grill must be pre-seasoned prior to using. 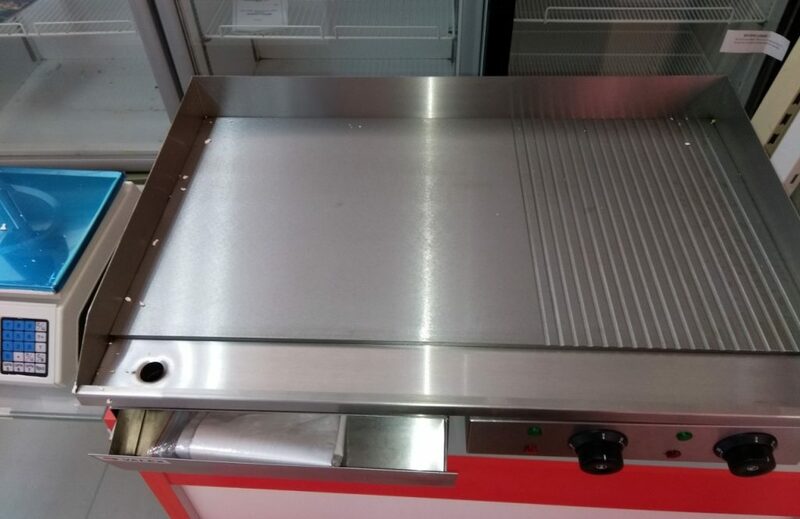 Customer service was not the best, and was hard to reach, state some users who own this griddle. My first thought upon seeing this stainless-steel Blackstone grill was that of a happy one. It reminded me of fun days with friends at the beach when we were kids, just hanging out and grilling while hanging around and talking about the future. While those days are well in the past, this grill is here to stay. This one is great for camping, hanging around the local park, or even right in the backyard. The cooking surface is on the smaller side, but still gives you the quality you expect from the Blackstone name. I found it easy to carry around and lightweight in that regard, and the folding legs on it were oh so wonderful. They were a breeze to fold down. I also appreciated the ability to switch between griddle and grill settings. If you want that authentic grill look, you can use the raised surface to get those nice grill marks on your burgers and other foods. Meanwhile if you’re with somebody that doesn’t care for those marks, you can just use the griddle side and it’ll be fine. We used it out back and it was fine, but I think this was meant to be used for campers or tailgaters. It was rather small for family use, but the grill really did a great job of cooking up our food. It uses a 1-pound propane tank which lasts about 2 hours when you grill. Did I mention this thing rolls like luggage? It doesn’t get much easier than this. You can disconnect the legs and use this on your tabletop. You can roll this along like luggage-makes it super easy to carry along. Lightweight, easy to clean up, and dual cooking surfaces make it a winner. Cannot operate without its own specially-made regulator, so you RVers have to get one of these if you want to connect it to your RV’s propane system. Really small and only useful for small groups or camping/tailgating. Back legs extend out rather far-keep kids and pets away from that, so they do not trip and fall or knock the grill over. These Blackstone grill reviews were a joy to write because I know that spending time with family can feel few and far between at times. 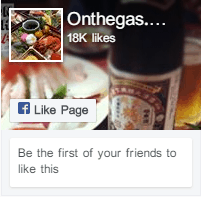 This enables you to really enjoy some of that special time with your family even more. Instead of one person standing at the stove while everybody else is eating, now you can make all the food at once without fear of cross-contamination or getting out different pots and pans. Many of these grills are wonderful for home use or even camping/on the go, so you might consider picking up one now for your home and then getting one for the road later on. The 36-inch Blackstone was my favorite by far, as it is just perfect for huge families and groups. But no matter which one you choose, you’re sure to be happy if you choose one from this detailed Blackstone grill reviews. My family sure was.